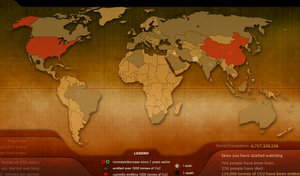 BreathingEarth.net is a presentation that displays the carbon dioxide emission rates, birth rates, and death rates of every country in the world. It displays this information visually, and in real-time. BreathingEarth.net has been installed as part of Vancouver’s Science World exhibition, and is the creation of David Bleja, who has built the presentation in Flash, using graphics that he made in Photoshop. This is nuts and frightening.